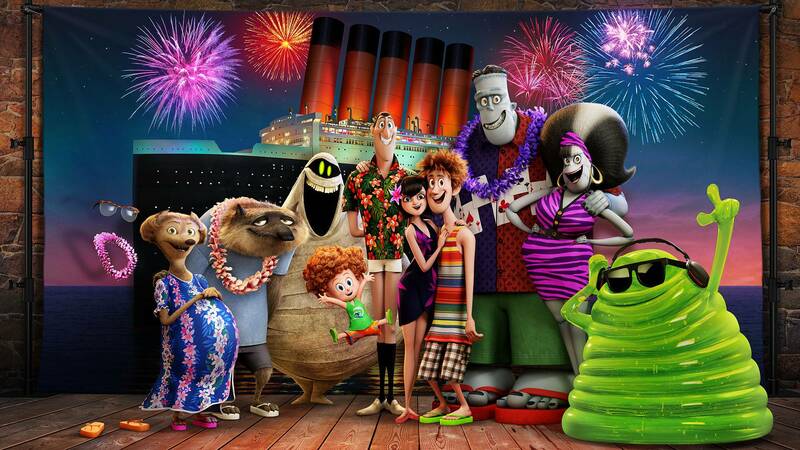 "Hotel Transylvania 3" opens Thursday. In Amarillo theaters this week: The Rock faces disaster, and Dracula faces a sea cruise. Plus, my thoughts on the new Mister Rogers documentary. I was off last week, so I didn't get to note that this highly anticipated documentary about Mister Rogers was opening. I regret it deeply, because I need to take any chance I get to proselytize for this remarkable film. Fortunately, despite low ticket sales in its first week, it will hold over for at least one more week at Cinemark Hollywood 16, and I implore you: Go see this film. Documentarian Morgan Neville (Twenty Feet from Stardom) manages to craft a movie that's a poignant tribute to the beloved PBS star without totally deifying the man but also without revealing any deep, dark secrets that tarnish his legacy. How big of a relief is that? When we've seen the reputations of countless prominent men taken down by the #MeToo revelations of their despicable actions, it's more than a bit joyous to discover that Fred Rogers was pretty much exactly as he appeared — a (mostly) mild-mannered, empathetic, compassionate father figure for innumerable children across the country. In Neville's remarkably tear-jerking (seriously, you're going to weep) account, we learn of Rogers' background as an ordained Presbyterian minister and how he felt called to work in children's television — a mission he took on with evangelical zeal, though still as gentle and soft-spoken as he always appeared. It's a delight to learn that Rogers was just as kind off screen, though capable of enjoying some slightly ribald humor and also capable of learning and growing from his own mistakes. And it's thrilling to see how radical he was for his time, still in that same tender manner. And just what was so radical? The idea that all of us — every one, no matter race or age or gender or sexuality or disability— is worthy of being loved. Indeed, was loved by this fatherly stranger. Not that we’re all snowflakes or whatever bunk is spouted by those whose hearts aren’t as open as Rogers’ was, but just that we’re good enough as ourselves to be worthy of being loved. Just as simple as that. Along those lines, the film is also a stark reminder of how absent gentle, loving voices like Rogers' are missing in today's society. I'm not saying it's easy to lead with kindness — I certainly struggle myself. But what's a more worthwhile legacy? Getting people frothing mad by screaming about made-up threats, or touching their hearts with love and kindness? I mentioned that you'll weep — and trust me, you will. But it's not over any deep sadness that the film uncovers. No, it's more like crying's the only appropriate response to the beauty of this man's heart. That said, I'm almost glad he's not around to see what society has become: If he was so horrified that children were tying blankets around their necks to emulate superheroes, he would be apoplectic to see what passes for role models today. But, man, do we ever need him. Former pro wrestling champions Bret Hart and Billy Graham talk with fellow vets about the toll taken by the sport in this documentary film that'll screen at 7 p.m. Thursday at Amarillo Star 14. Watch an outdoor evening screening of recent hit musical The Greatest Showman and enjoy food trucks, performances by Amarillo Opera and vendor sales. The party begins at 7 p.m. Saturday at The Shops at Wolflin Square, 1932 Civic Circle. Admission is Free. Call 806-355-6131. The TCM Big Screen Classics series continues with a 30th anniversary presentation of the Tom Hanks comedy at 2 and 7 p.m. Sunday and Wednesday at both Amarillo Star 14 and Hollywood 16. All three Amarillo movie theaters are offering summer-long specials on family films. Click here for the full schedule. Regal Summer Movie Express: Animated features The Lego Ninjago Movie and Ferdinand will screen at approximately 10 a.m. Tuesday and Wednesday at Amarillo Star 14. Admission is $1. Premiere Cinemas Summer Kids Fest: Animated feature Despicable Me 3 will screen at 10 a.m. Tuesday and Wednesday at Premiere Cinemas Westgate Mall 6, 7701 W. Interstate 40. Admission is free. Cinemark Summer Movie Clubhouse: Animated feature Ferdinand will screen at 10:30 a.m. Wednesday at Hollywood 16. Admission is $1. July 19: Advance tickets are on sale for musical sequel Mamma Mia! Here We Go Again and thriller sequel The Equalizer 2 at both Amarillo Star 14 and Hollywood 16. July 20: Thriller sequel Unfriended: Dark Web is scheduled to open, but advance tickets are not yet on sale. July 22 to 25: The Studio Ghibli Fest 2018 continues with fantasy adventure Princess Mononoke at both Amarillo Star 14 and Hollywood 16. An English-dubbed version will screen at 12:55 p.m. July 22 and 7 p.m. July 25, with a subtitled version screening at 7 p.m. July 23. July 26: Advance tickets are on sale for action sequel Mission: Impossible — Fallout at both Amarillo Star 14 and Hollywood 16. July 26: An encore screening of Newsies: The Broadway Musical will return for special summer showings at 7 p.m. July 26 and 12:55 p.m. July 28 at Amarillo Star 14. July 27: Animated feature Teen Titans Go! to the Movies is scheduled to open, but advance tickets are not yet on sale. July 28 and 30: An encore screening of Sailor Moon R — The Movie will precede the premiere of Sailor Moon S — The Movie in a special event. They'll screen at 12:55 p.m. July 28 (English-dubbed) and 7 p.m. July 30 (subtitled) at both Amarillo Star 14 and Hollywood 16. Aug. 1: The eighth annual Grateful Dead Meet-Up at the Movies will feature a screening of the band's July 7, 1989, concert at J.F.K. Stadium in Philadelphia, the final concert performed at the since-demolished stadium. It'll screen at 7 p.m. Aug. 1 at Amarillo Star 14. Aug. 2: Advance tickets are on sale for children's fantasy Christopher Robin and action comedy The Spy Who Dumped Me at both Amarillo Star 14 and Hollywood 16. Aug. 2: Best-selling author Rachel Hollis' story is told in the inspirational documentary Made for More, followed by a Q&A with the author in this special streamed event. It'll be seen at 7:30 p.m. Aug. 2 at both Amarillo Star 14 and Hollywood 16. Aug. 3: Sci-fi thriller The Darkest Minds and thriller Searching are scheduled to open, but advance tickets are not yet on sale. Aug. 4 and 6: An encore screening of Sailor Moon R — The Movie will precede the premiere of Sailor Moon Supers — The Movie in a new special event. They'll screen at 12:55 p.m. Aug. 4 (English-dubbed) and 7 p.m. Aug. 6 (subtitled) at both Amarillo Star 14 and Hollywood 16. Aug. 5 and 8: The TCM Big Screen Classics series continues with a 20th anniversary presentation of the Coen Brothers comedy The Big Lebowski at 2 and 7 p.m. Aug. 5 and 8 at both Amarillo Star 14 and Hollywood 16. Aug. 7: Singer Jason Mraz will treat audiences to a family friendly celebration of the creative arts in the documentary-style feature Have It All: The Movie, featuring new material from upcoming album Know. It'll screen at 7 p.m. Aug. 7 at both Amarillo Star 14 and Hollywood 16. Aug. 9: Watch the Drum Corps International world championship prelims live from Lucas Oil Stadium in Indianapolis in Big, Loud & Live 15. The event will begin at 5:30 p.m. Aug. 9 at both Amarillo Star 14 and Hollywood 16. Aug. 10: Comedy Dog Days and thriller The Meg are scheduled to open, but advance tickets are not yet on sale. Aug. 12 to 15: The Studio Ghibli Fest 2018 continues with historical masterpiece Grave of the Fireflies at both Amarillo Star 14 and Hollywood 16. An English-dubbed version will screen at 12:55 p.m. Aug. 12 and 7 p.m. Aug. 15, with a subtitled version screening at 7 p.m. Aug. 13. Aug. 14: The horror film Blood Fest, featuring a slasher targeting a film festival celebrating horror movies, will get a one-night-only screening at 7:30 p.m. Aug. 14 at both Amarillo Star 14 and Hollywood 16. Aug. 15: Romantic comedy Crazy Rich Asians is scheduled to open, but advance tickets are not yet on sale. Aug. 16 and 20: The iconic televised concert in which Elvis Presley relaunched his singing career will be seen again in Elvis '68 Comeback Special, a 50th anniversary reissue with behind-the-scenes footage and more. It'll screen at 7:30 p.m. Aug. 16 and 20 at both Amarillo Star 14 and Hollywood 16. Aug. 17: Action thrillers Alpha and Mile 22 are scheduled to open, but advance tickets are not yet on sale. Aug. 20: In faith-based drama An Interview with God, young reporter (Brenton Thwaites, Pirates of the Caribbean: Dead Men Tell No Tales) struggles with his dying faith after covering the Afghanistan war, then meets a mysterious man (David Strathairn) claiming to be God. The film will screen at 7 p.m. Aug. 20 to 22 at both Amarillo Star 14 and Hollywood 16. Aug. 23 and 25: The RiffTrax crew wil take on notoriously awful sci-fi film Krull in a live screening at 7 p.m. Aug. 23, followed by an encore at 12:55 p.m. Aug. 25, at both Amarillo Star 14 and Hollywood 16. Aug. 24: Family adventure A.X.L., dark puppet comedy The Happytime Murders and horror film Slender Man are scheduled to open, but advance tickets are not yet on sale. Aug. 26 and 29: The TCM Big Screen Classics series continues with a 60th anniversary presentation of the Rogers & Hammerstein musical South Pacific at 2 and 7 p.m. Aug. 26 and 29 at both Amarillo Star 14 and Hollywood 16. Aug. 31: Sci-fi action film Kin and Spanish-language dramedy Ya Veremos are scheduled to open, but advance tickets are not yet on sale. Click on titles for my review and on theaters for showtimes. Adrift (WM-6); Ant-Man and the Wasp (AS-14, H-16 and Tascosa); Avengers: Infinity War (WM-6); Book Club (WM-6); The First Purge (AS-14, H-16); Hereditary (WM-6); Hotel Transylvania 3: Summer Vacation (AS-14, H-16 and Tascosa); The Incredibles 2 (AS-14, H-16); Jurassic World: Fallen Kingdom (AS-14, H-16); Life of the Party (WM-6); Ocean's 8 (H-16); Overboard (WM-6); A Quiet Place (WM-6); Sicario: Day of the Soldado (AS-14, H-16); Show Dogs (WM-6); Skyscraper (AS-14, H-16 and Sandell); Tag (AS-14, H-16); Uncle Drew (AS-14, H-16); and Won't You Be My Neighbor (H-16).